The Optima TFprofi presents the perfect combination of high performance and reduced tractor power requirement. The hydraulic folding trailed frame with eight HD rows comes together with a 2,000 litre fertiliser hopper. The Optima TFprofi is either equipped with a hydraulically or mechanically driven fan and can be operated even by a tractor of 80hp only. No lifting power is required. The fertiliser hopper can easily be filled with a front loader, big bags or as an option by filling auger. Different fertiliser coulters are available. As an option the fertiliser application can be driven electro-hydraulically. The combination of the Optima with iXtra LiFe allows the application of liquid fertiliser during seeding. For more information, please see iXtra LiFe. The Optima TFprofi offers constant seeding depth control and high frame stability. As standard the TFprofi is equipped with a CAT3N cross shaft. Thus the pivot point lies substantially behind the tractor tyres. This brings two advantages for the driver. Firstly turning at angles of up to 90° are possible, secondly the Optima TFprofi follows the tractor tracks in curves. The fan is assembled on the cross shaft. Thus the pto shaft is always straight and the wearing of the universal joints is minimized. The Optima TFprofi can be equipped with four landwheels as an option. They carry the machine during work and half the ground pressure both in work and on the headlands. The landwheels are fully floating; thanks to an intelligent hydraulic system that allows the wheels to follow the ground contours individually. All four hydraulic cylinders are of dual chamber design. The upper part of the machine cylinder is for the lifting and lowering of the machine. The lower chamber is connected to the adjacent cylinder, to enable the cylinders to counterbalance each other. This allows the landwheels to follow the ground contours individually (by as much as 15cm in either direction) which guarantees the same constant pressure on all wheels. At the same time when working in rough conditions frame movements are reduced by 50%. This results in improved smoothness of ride, even at higher working speeds of up to 12km/h. To prepare the TFprofi for road transport, the driver simply starts the folding process directly from the tractor cab. The wing sections are hydraulically swung to the front of the machine next to the drawbar. The transport width is 2.98m only (3.40m at 80cm row width). A maximum transport speed of 40 km/h is possible even with a 3/4 filled hopper when equipped with the optional pneumatic or hydraulic brake system. Optimal depth control even under extreme conditions, due to the heavy basic weight of the sowing unit with the possibility to add additional pressure (up to 100kg) onto each individual sowing unit via the spring-loaded system. Effective ground contour following, due to the large lateral depth control by open gauge wheels (Ø410mm, width 120mm). Precise seed placement by the small coulter which forms a clean furrow. Light re-compaction and seed covering is done by the intermediate press wheel (as option: heavy stainless steel) and the multi-adjustable V-press wheel – to ensure maximum field emergence. 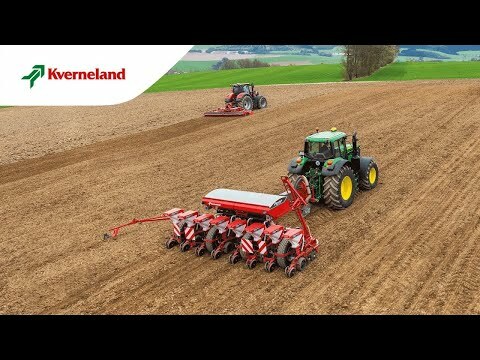 The patented seeding heart by Kverneland has reduced maintenance costs to a minimum. No friction, no wear, low drive torque, minimum maintenance: The seed disc rotates in the seeding heart together with the vacuum chamber. This seeding drum is connected to the vacuum fan via a hollow shaft. Optimum depth control due to the heavy basic weight of the sowing unit with the possibility to add additional pressure (up to 100kg) onto each individual sowing unit via spring-loaded system. Precise seed placement by the small coulter which forms a clean furrow. Good placement, and seed covering is done by the smooth flexible intermediate press wheel and multi-adjustable V-press wheel. With the pressurized seeding heart, the seeds are “shot” by an airstream of up to 70kph into the furrow. A smooth, flexible intermediate press wheel catches and protects the delicate seeds. Any negative impact such as vibration on the way between release point and soil contact are eliminated due to the high air stream. The seeds reach their perfect position in the soil. Each sowing row is electrically powered by ISOBUS connection. An additional generator or other power sources are not required. The complete power supply and control is via ISOBUS. The new fertiliser hopper has a capacity of 2,000l. The wide opening of nearly 3m enables the filling with front loader or big bags. An optional filling auger is also available. The dosing units can, as an option, be driven electro-hydraulically. This is controlled and monitored via ISOBUS. The electro-hydraulic drive of the metering device enables constant adaptation of the application rate during work (as well as via application charts with GEOCONTROL). In addition the exact switching on/off at headlands is also possible. The fertiliser dosing is done by two quad outlet dosing units. Each row comes with its own air support to ensure the steady conveyance of high amounts of fertiliser especially when working on hillsides. Another option is that the fertiliser hopper can be placed on 4 weigh cells for a constant control and monitoring of the application rate. Prior to operation, the amount of fertiliser required for the job can be filled into the hopper and can be adjusted to what is really needed. For contractors whose machines work for several customers, a further advantage is the possibility to invoice the fertiliser used accurately to the kilogram.